If you’re looking for a comfy garden bench that can be used for outdoor dining or lazing in the sun, then look no further than the Palermo Ocean 3 Seater Garden Bench with Backrest. 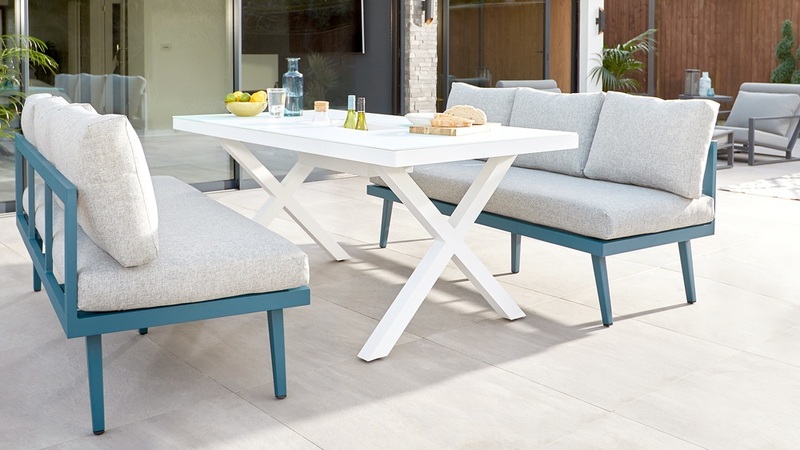 Part of our popular, exclusive Palermo range, the bench’s anti-rust and showerproof features mean it's ideal for outdoor living. With the same level of cushioning as our indoor range this bench is the perfect place to kick back and enjoy those long summer days. 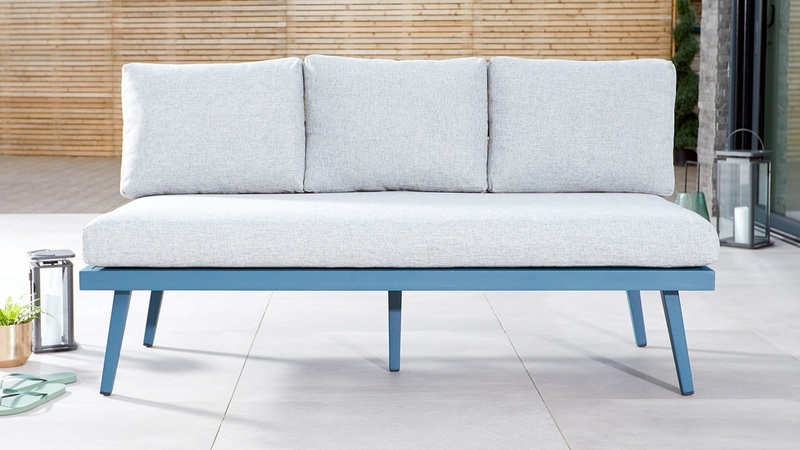 The Palermo range of benches have showerproof cushions. This is a key feature for outdoor furniture, so you don't have to take the cushions in every time there’s a light shower. It also means that spillages are easy to clean up - they simply wipe off the fabric. The cushion covers are made from a melange fabric which gives texture to the cushions. Melange fabrics hide marks and spillages better than a solid fabric making the bench low maintenance and easy to clean. To help extend the life of your bench we’ve added an anti UV coating. A premium feature for an affordable product, the anti UV coating will help to prevent the colour of the bench fabric from fading when exposed to direct sunlight for hours at a time. For more information on this, check out the Designer's Note below. 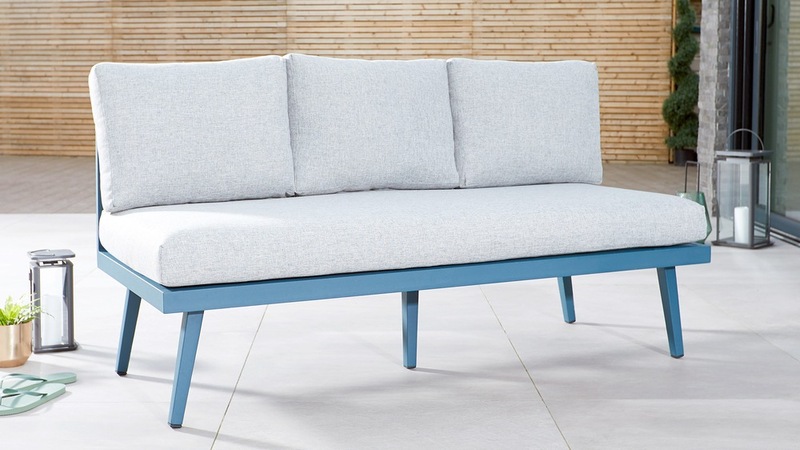 The bench frame is finished in a modern matt powder coat, which is hard-wearing and easy to look after. 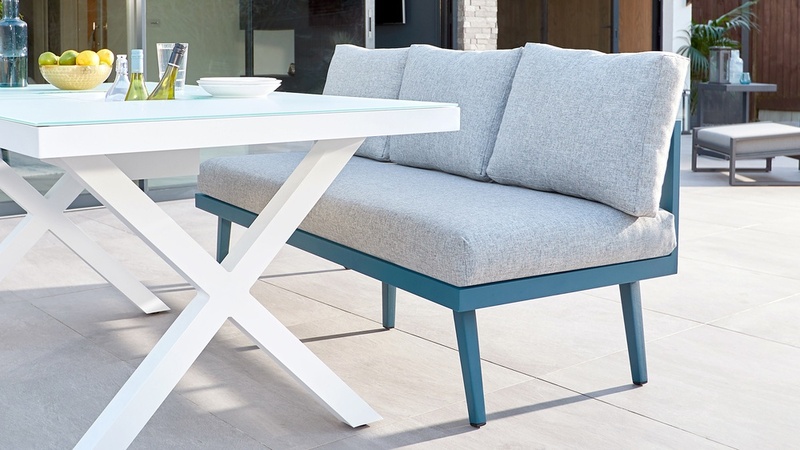 We’ve chosen an ocean colour to give the bench a fresh, modern look and is perfect for brightening up your garden living area. The foam and fibre filling used for the garden bench cushions is the same foam density that we use for our interior seating. So, whether you’re sitting at the dining table or reading a book in the sun, you can really relax back into the bench and get comfy. There’s nothing more annoying than cushions that keep falling off or moving out of position. With this in mind, we’ve added an anti-slip mat to the underside of the Palermo Bench cushions, this reduces movement but still means that you can easily remove the cushion for cleaning and storage. Team the Palermo Garden Bench with the Palermo Coffee Table and Palermo Corner Bench to create a great space for garden entertaining.